Fukuoka tour vol.3 came to Matsumoto to participate a seminar and a meeting. I can always enjoy drinking with him. This "DENKI BURAN" is popular among people who love drinking. In Matsumoto,we can drink at "YUMEYA" in "SYOWA YOKOCHO",but we can rarely see this other bar near here. I drank it for the first time when I visited my friend who lived in my hometown in my university days. Because it is strong liquor,I coudn't drink my glass completely. at their home whose love drinking. I heard it is made of mainly brandy,and gin and wine curacao,in additon,some herbs. Certainly,I can taste refreshed ,and complexed flavor when I hold it in my mouth. Producers keep a secret about the method of production. "How to drink DENKI BURAN as an expart of DENKI BURAN". She told me "You had better drink it with beer and HACHI BUDO PUNCH". When I tried it,I could taste many various flavors! 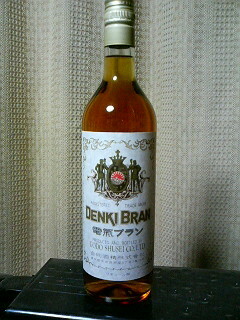 Mr.Ackey brought me special "DENKI BURAN"called "OLD",which contains 40% alcohol,in last week. I got "PEPSI NEX" at a super market store nearby by chance. I think COLA also make nice combination with "DENKI BURAN. Shall we go drink to "KAMIYA bar?